Finnish vocalist Jari Tiura may not be a household name to many hard rock and heavy metal fans, but I'll bet you know him. 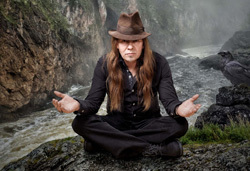 From 2004 to 2007, Tiura was Michael Schenker's lead vocalist for MSG and appeared on Tales Of Rock N Roll. No longer with Schenker, he's the lead vocalist for Finnish melodic power metal band Stargazery, with whom he recorded two albums. Recently working with friend and producer Sami Ala-lahti, Tiura has been writing songs for his very first solo album, King Of Lions. As a vocalist, Tiura has a strong voice with some range, which wraps around the melody and harmony of every song. Sometimes he gets overwhelmed by the music or his enunciation suffers, but he still sounds terrific. For the music of King Of Lions, Tiura chooses melodic hard rock with a significant metal edge, yet wrapped in AOR accessibility. The hard rock angle comes from the inherent big beat and groove present in every arrangement. The metal edge arrives from the sharp riffage, the sometimes heavy bottom end, and the blistering guitar solos, which are abundant and killer from Yrjo Ella. (I don't know who this fellow is, but he's the bomb when it comes to guitar work.) There's some serious heavy metal stuff happening here. The AOR presence is informed by all these things, but mostly from the deliberate melody and rock groove, but also from the attention to catchy and memorable refrains. Honestly, King Of Lions is the perfect storm of metal-infused AOR melodic hard rock. As constant readers know, I usually highlight a few songs. But it's enough to say, every song here is interesting, entertaining, and so, satisfying. Favorites include the bass driven London, very catchy Friends and Foes, the inspirational Take On The World, and the guitar monsters Blue Sky Lightning and Away From All The Magic and Wonder. I fine piano driven ballad comes with Lion Of Judah. All in all, as said before, King Of Lions is the perfect storm of metal-infused AOR melodic hard rock. Get it. You won't be disappointed. 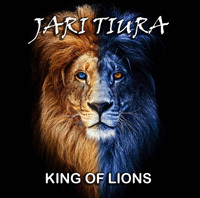 Jari Tiura's King Of Lions is the perfect storm of metal-infused AOR melodic hard rock. Get it. You won't be disappointed. Easily recommended.